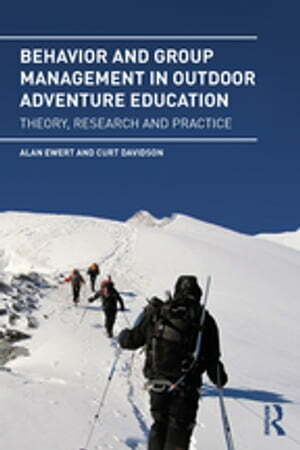 Collins Booksellers - Behavior and Group Management in Outdoor Adventure Education by Alan Ewert & Curt Davidson, 9781317388456. Buy this book online. Outdoor adventure activities are becoming an increasingly popular part of physical education programs. The physical risks of these activities are often foremost in the minds of both instructors and participants, yet it is managing group behavior which can prove to be the most difficult. This is the first book for students and practitioners to address this essential aspect of outdoor adventure education (OAE). Outlining key evidence-based training practices, this book explains how to interact with groups ranging from adolescents to military veterans within a variety of outdoor adventure education contexts. It provides practical advice on how to promote positive behavior, while also offering guidance on how to mitigate negative behavior and manage a variety of challenging behavioral issues. With ten chapters full of real world examples from rock climbing to wilderness trekking, it provides a comprehensive guide to understanding the complexities of behavioral group management (BGM) in theory and practice. Thisbookis vital reading for students training to be outdoor physical education instructors and for practitioners looking to enhance their group management skills.